Low-rise red-brick bank building at left on the northeast corner of 91st Street and Madison Avenue is center of dispute with community activists wanting it not to be developed with an apartment tower. View is looking south from 92nd Street. This is a story about one of the best and most active community groups in the city and its interpretation of how Historic Districts should perform and the role of the press in covering such controversies. The New York Times and The New York Observer, to their credit, both covered hearings on this case before the city's Landmarks Preservation Commission in February, 2000, at which Woody Allen, the movie director and a new resident in the Carnegie Hill neighborhood where the proposed project is located. Mr. Allen distributed copies of a three-minute video he had made to argue against what he termed an "egregious mistake." The Carnegie Hill Neighbors argued that "the vulnerable Citibank site is on the first of three consecutive Madison Avenue intersections that comprise the 'Commons,' our designation for the three-block section that surrounds the intersections of 91st, 92nd and 93rd Streets in the heart of Carnegie Hill....One unifying element of the 'Commons' is the unusual prevalence of rowhouses - 29 in total, all built by 1890...A further unifying element is that two-thirds of these were designed by only two architects, James E. Ware and A. B. Ogden....Of the 29 original houses, 21 reemain essentially intact. Remarkably, the structures that replaced the eight demolished rowhouse are either of equal height or lower, thus maintaining the low scale character...While taller buildings also exist at each intersection, their dominance is mitigated by the pattern in which they are arranged. at each intersection, at least two buildings are low in scale and positioned so that they diagonally opose each other... Of the three intersections, this was originally the lowesst, but in the last 70 years, two tall buildngs have replaced the lower structures of the other two corners. There is, therefore, no room for a third tall building at this intersection if the low-scale village feeling is to be preserved and the northward march of the canyon walls is to be avoided." Clearly, if this logic is to be followed, we should raze Manhattan to the ground. Look out for those canyon walls. What's so special about about 1890. Why not roll back the clock to 1690, or 1490? The City Review, unfortunately, did not cover the hearing nor publish an article on this controversy until now, quite long after the commission ruled in favor of the community activists and against the developer. Community activists, of course, very often raise very legitimate and important concerns and not every developer, of course, is inspired. Like the presence of Jackie Onassis in controversies over the landmark status of Grand Central Terminal and the length of shadows that might be cast by a proposed new tower on the site of the New York Coliseum at Columbus Circle, the presence of Woody Allen as an opponent of a proposed, 17-story apartment building on the northeast corner of Madison Avenue and 91st Street on a site long occupied by a not terribly interesting-looking, one-story bank building was widely publicized and helped to sway the landmarks commission to deny a "certificate of appropriateness" for the proposed tower. In this case, at least, the building has not yet been built so it does not yet have to be demolished to satisfy the brick-lust of the community activists and the need for sunshine in Woody Allen's life, or garden, or the nice views of the Brick Presbyterian Church at the other end of the block for some residents of the medium-size apartment tower on the avenue directly across from the site in question. The community activists, of course, are not at fault and are to be praised for their efforts in most instances. The blame lies with the city's politicians and their cowardice and design ignorance. View from 87th Street looking north on Madison Avenue shows two very tall apartment towers on same side of avenue that are much taller than the proposed building for the site in question that is pointed to with yellow arrow. The bank building occupies a prime site at one of the highest points in the Carnegie Hill neighborhood, which over the last decade or so has become one of the most sought-after residential locations because of its concentration of many schools, religious institutions and high-quality, pre-war apartment buildings with large apartments. Madison Avenue has long been the "Main Street" of Carnegie Hill with many boutiques and a few restaurants as well as hardware and stationery stores. Many of the city's most important cultural institutions such as the Cooper-Hewitt Museum of Design in the former Andrew Carnegie mansion, the National Academy of Design, the Jewish Museum and the Solomon R. Guggenheim Museum are all located on Fifth Avenue in the high 80's and low 90s. The International Center of Photography had occupied the former Willard Straight mansion at 94th Street and Fifth Avenue but rather surprisingly announced in 2000 it would relocate to midtown. The proposed new tower would not be the first in this stretch of Madison Avenue as Rose Associates erected a 45-story, red-brick apartment tower between 89th and 90th Streets and another highly visible, beige and angled apartment tower was built a few years later on the southeast corner of the avenue at 94th Street. Furthermore, most of the avenue in the immediate vicinity and to the south and west is filled with apartment buildings of 12 to 18 stories. The City Review was negligent in not covering this controversy earlier and indeed had requested and obtained a copy of the proposed development plans from the architectural firm, Platt Byard Dovell. After studying the plans, I was convinced that the proposed tower was very much in conformity with the general massing of most of the surrounding apartment buildings and was, indeed, in some ways better because its façades had large multi-paned windows that gave the project a handsome texture that employed an old design treatment with a nice and modest touch of modernity that was not out of keeping with some of the nearby Art Deco buildings. View from middle of 91st Street between Madison and Park Avenues shows white apartment house directly across from the site in question and approximately same size as proposed tower. The one glaring problem with the proposal was its exposed watertank, which can be seen in the architectural drawing below from the west. Exposed watertanks flourish and abound on the city's skyline and many people find them rather quaint, despite the fact that some of the better developers and architects have often found very interesting and decorative ways to enclose them to add a handsome flourish to their projects. The exposed watertank, however, was not highly visible from most other directions and the proposed tower's aesthetics were certainly no worse than the similar size apartment buildings directly across the avenue, a white-brick building, and across 91st Street. A closer reading of the developer's proposal, however, revealed that the developer and architect had indeed paid great attention to the question of exposed watertanks and found that almost a majority of the apartment buildings with an adjacent area of several blocks had exposed watertanks. The exposed watertanks are incongruous with the otherwise quite distinguished architecture of many of these old buildings and this plan visually hid part of the exposed water tank with a vertical element on the avenue side. While the developer and architect obviously covered their tracks on the watertank issue with their extensive documentation, the exposed watertank was a design element that should have been decoratively enclosed given the prominent visibility of the site and while this would obviously be more expensive for the development it would not significantly alter the building's economics most likely. It should be pointed out that the existing building on the site is particularly unattractive. While its red-brick masonry is pleasant, the building has no design distinction and is rather blatantly festooned with large blue and white signage for Citibank that is perhaps as offensive to this "refined" neighborhood" as a rather stark and bold sign for a Duane Reade notions store that opened up a couple of years ago two blocks to the south on the avenue in a mid-block location with less visibility than the bank's sign. Such signage is not discrete and is very commercial and not in context with the overall neighborhood pattern. The opponents to the proposed tower did not argue to preserve the existing building out of love for its architecture or its signage, but because it was only one-story high it did not cast shadows on the mid-block gardens to the east, including one recently purchased by Woody Allen, and therefore also opened up vistas of the handsome mid-block buildings on 91st Street and the graceful spire of the Brick Presbyterian Church on Park Avenue at the end of the block. An argument could be made that the occasional low-rise block on Madison Avenue permits a greater sense of openness and more "light and air," zoning concepts that are valid in many instances. This is one of those sights that deserve such consideration since the buildings that occupy the north half of the avenue blockfront adjacent to the proposed tower on the east side are not only low-rise but quite charming. There is a real problem, however, with this approach as it permits Historic Districts to override local zoning and subject property owners within them to the current whims of local community activists and the Landmarks Preservation Commission. Views and shadows have no legal standing in the city's zoning and indeed history for the true character of New York is its changing, eclectic skyline, which would be not exist if the protectors of views and shadow-chasers had their way. There are some occasions, one must admit, with some views are very important and perhaps should be held sacrosanct, or somehow protected. Perhaps the most obvious example is the blocking of much of the view from north of 59th Street on Fifth Avenue of the Empire State Building by the handsome and interesting skyscraper at 712 Fifth Avenue (see The City Review article on that skyscraper). Although I pointed out in an article in The New York Times many years ago that the double skywalks across Lexington Avenue proposed, and subsequently built, by Hunter College at 68th Street would block and severely interrupt the vistas up and down the avenues and set a very bad precedent, no preservationists came forward to attack them. In earlier times, one could argue that Trinity Church's spire at Wall Street and Broadway should not have been topped by adjacent buildings, and indeed the City of Philadelphia did debate for a while not permitting new towers to rise above its sensational and tall City Hall, although in the end taller towers were built. The view of New York's own City Hall was blocked for many years by a wedding-cake pile of an office structure at the south end of City Hall Park. Conceiveably, the city could have enacted legislation that would require a public review and approval process for specific, extraordinary individual New York City landmarks, but it has not, instead creating Historic Districts in which all proposed changes must be approved by the Landmarks Preservation Commission, as in this case. The only building in this case whose view would be partially blocked from one direction is the Brick Presbyterian Church and the view that would be partially blocked is of its back and the blocking of that view is not catacyclismic to the aesthetic stability of the church or the city. All that one can say to the few residents who might have to suffer altered views or more shadows is "tough." A basic premise of the city's zoning in residential areas has long been that midblocks should be low-rise and taller buildings permitted on the avenues, which are broader than the sidestreets. Views are a very expensive premium in New York real estate and understandably so, but New York City real estate is sold "as is" and developers and owners do not have infinite control of views in all directions from their properties and it is preposterous to suggest that they should or could. In 1961, four years before the city finally got around to creating a landmarks law, the First National City Bank, the precessor to Citibank, demolished four Queen Anne townhouses that were built in 1885-6 on the northeast corner of 91st and Madison Avenue and had been acquired by the bank in January, 1950. It erected a one-story building on the site in 1951 that was designed by Lusby Simpson, an in-house architect for the bank, who died in 1954. The one-story building used red brick but was, and is, quite plain, as can be seen in the photograph at the top of this article. When the citys Landmarks Preservation Commission created a Carnegie Hill Historic District, it specifically excluded this site, perhaps because there were few defenders of its architectural merit. Subsequently, the commission significantly enlarged the historic district and this site was included and as such any exterior change to it must be approved by the commission. 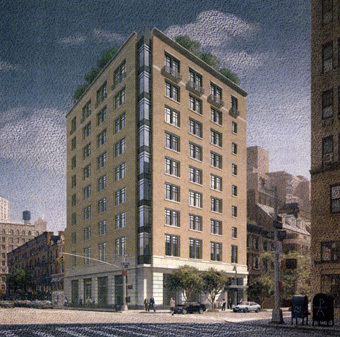 The Moinan Development Corporation applied to the commission for approval to erect a 17-story apartment building to replace the one-story bank structure and the commission held a hearing on the application at which some civic groups such as the Carnegie Hill Neighbors and residents, such as Woody Allen, who recently moved into the neighborhood, urged the commission to turn down the application, primarily on the grounds that they did not want a tall building on the site although one is permitted under zoning. The controversy is fairly classic Not In My Back Yard (NIMBY) syndrome. People entrenched in an neighborhood want to preserve their views and therefore their property values, maintain the status quo and prevent more people from living in the neighborhood. In the 1960s and 1970s, some inroads were made by regional planners and civil rights activists against what was then called "exclusionary" zoning in some suburbs that made it difficult economically for new people, especially not superwealthy people, from acquiring property. Some local zoning regulations were rewritten that somewhat eased the "restrictiveness" of such laws and some progress has been made to prevent them being used for racial discrimination. In the 1970s, the environment movement had its biggest victory when Marcy Benstock campaigned successfully to block the city from receiving more than a billion dollars in Federal subsidies to create very significant new park land along the Hudson River in Manhattan as part of the Westway plan to rebuild the deteriorated West Side Highway. She was, remarkably, able to convince Federal courts and the Army Corps of Engineers that some fish habitats might be disturbed by the large planned landfill that would have been the second greatest park in the city after Central Park. Her Goliathesque victory emboldened neighborhood activists all over the city to wage vigorous campaigns against almost all new proposed developments. Some were opposed because they were considered locally undesirable local uses (LULUs), others because they were considered not to be in context architecturally, others because they were too big, and others just out of plain, good old American oneryness. Some major projects suffered agony for many years before being reborn in different guises, most notably the plans of Prudential Life Insurance Company and Park Tower Realty to redevelop West 42nd Street and of Boston Properties, which is headed by Mortimer Zuckerman, the publisher of U. S. News & World Reports and the New York News, to erect a large, mixed-use tower on the site of the New York Coliseum at Columbus Circle. The grandiose former plan was subdivided after tortuous years of legal challenges and subsequently developed in a rather helter-skelter fashion mostly by other parties after the original plan and commitment had led to the incredible renaissance of Times Square. The latter plan was thwarted by a group of civic activists that had support by the Municipal Art Society and such well-known figures as Jacqueline Kennedy Onassis and Bill Moyers, the journalist, who argued that the tower would cast terrible shadows in Central Park but who calmly chose not to call for the demolition of the General Motors Building or all of Central Park South, which also cast such shadows. The courts have extended citizens protections from many things, but not yet shadows. How could these concerned citizens be so successful in battling the forces of evil they perceived? The answer traces its roots back to the early days of tabloid television when the loudest screamer at a rally would get the most air-time and to the empowerment of local community boards, which were created in the 1960s and given an important role in zoning some years later when the city revised some of its Uniform Land Use Review Process (ULURP) procedures. There are 12 community boards in Manhattan and many more in the other boroughs. Any development project that is not "as-of-right," that is, which requires any public approval, or variance, must be submitted to the ULURP process. The real responsibility for preventing aberations and abuse of the landmark process is a responsible, accurate and timely press for it is the duty of the press to alert and bring pressure on politicians and the public. The City Review was derelict in being so late in reporting on this proposal. Conceivably, the plan can be resubmitted, a bit shorter, perhaps, and with an enclosed watertank and hopefully sanity will return to Carnegie Hill. The design of the proposal tower was conservative, dignified and rather contextual. In December, 2001, the city's Landmarks Preservation Commission approved the developer's third proposal for the site but requested a revised treatment of the building's windows. (5/25/02).